The passion to pursue your dreams and your goals. The courage to never give up and to move forward with your life. The strength to accomplish everything. Attributes that famous royalties did posses in the past! Something that is also reflected in your energy level while wearing the Blood of the Marquis; it constantly drives you to push forward. What you will also realize is that as you are pushing forward through all adversity, the foundations for your success is yourself; as a visionary, as a leader, as someone who reaches out to touch the stars - the shackles that were binding you are no more; nothing can stop you from living your own life as you desire and nothing can stop you from realizing your own dreams. You become true royalty - worthy of wearing the blood of the Marquis; you become the Marquis! Exclusively made of Coral stones. The first question is, why Coral Stones? 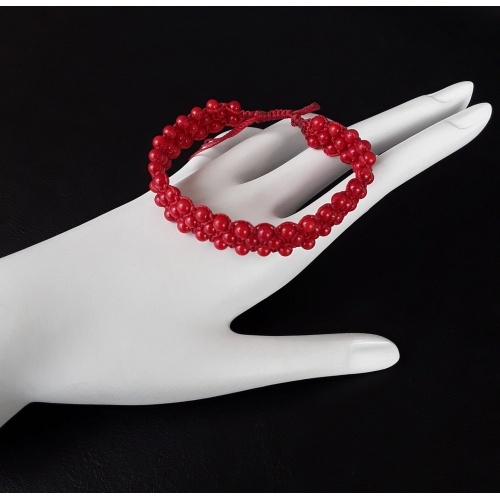 By wearing an authentic blood red coral stone bracelet (which for example is the case with all of our products that use Coral Stones) will allow the wearer to access energy freely, allowing a clear flow and use of coral stone healing to nurture themselves physically as well as spiritually. The "Blood Flower of the Marquis" has been designed to be elegant but above all to be very light while wearing it. Keep in mind: it is focused towards your own soul and not the materialistic realm - and as you most probably are aware of, the spiritual realm has almost zero weight. 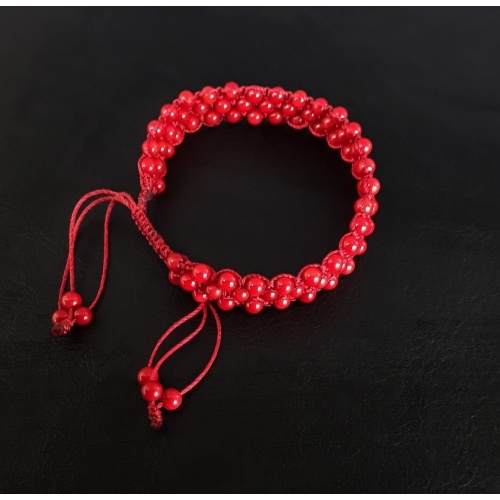 What is more, each of the 83 coral stones has been energy infused and gradually was inserted in the shape of the bracelet. Coral can be found in a range of colors, which can be red, brown, black, and blue. 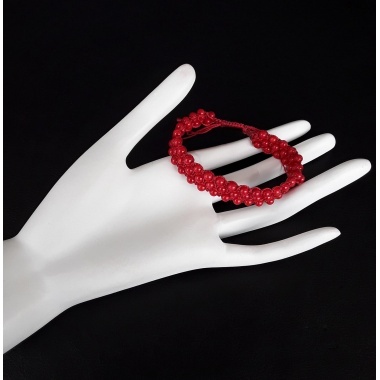 Red is the most sought-after color of Coral, and only two types of Coral can be made into jewelry. These are corallium japonicum and corallium rubrum. Coral was once believed to be a plant, but it’s actually made up of polyps. The accumulated skeletal masses from these polyps are what create Corals. Coral can be found in the waters of Africa and Japan, and off the coast of the South Pacific and Australia. Just like Azurite, Coral is known as the stone of peace and transformation. Red Corals, will help you release unhealthy thoughts and emotions. Coral will remind you to form healthy and balanced opinions about different matters. The energies of this stone will also remind you to be inventive and creative when it comes to different situations and resolving your personal or professional issues. The healing energies of Coral also vary depending on the Coral’s hues, but it has a lot of energy that will prevent you from wallowing in depression. It will also assist in purging the toxins and purifying your body, especially if you combine it with Rhodonite. This stone is aware that the currents of life will push you to harsh and unhealthy environments. It will give you the strength to stand your ground and fight the tendency to just drift and become lost at sea. How Will Coral Help You? Coral is a stone that has protective healing energies for women and children. It can help with issues associated with the circulatory system. It can also help with strengthening the bones and nourishing the blood. It can give support to the nervous system as well. Opal and Coral can be beneficial in treating facial eruptions, such as acne. It can also help with other skin diseases. This stone is known to work as a protective shield and defend against wounds, cuts, bruises, and other injuries. It can also work in improving blood purification. It promotes good mental health and physical well-being. It can treat depression and dispel languidness by revitalizing the body and mind. The energies of Coral can enhance tissue generation. It can also relieve tension and help with nutrient deficiency. It’s known to boost the digestive processes and regulate cholesterol. It can enhance the production and the absorption of niacin as well. Coral is said to be beneficial in treating lung difficulties. Coral can be a very beneficial stone to have, especially if you’re going through financial troubles. This stone can help you get out of debt and achieve financial independence. It will show you how you can manage your finances and boost your savings, even without a substantial increase in your income. The energies of this stone will make you recognize financial opportunities and stay away from ventures that sound too good to be true. Coral will also encourage you to make use of your God-given talents to improve your financial status and to be more responsible with your money decisions. It will protect you from ill fortune. This stone will strengthen your ability to invest and divest when necessary! Coral will help you eliminate uncontrollable emotions that can lead to obsessions. This stone will give you the power to overcome your relationship challenges and always be a step ahead of people who have less than honorable intentions for you. It will give you the courage to face your rivals and get past your hindrances. The energies of this stone will also dispel the lethargy that you’re going through with your partner or your relationship. Coral will give you the endurance to keep your promises and to come through for your significant other when they need you. Coral will inspire you to conquer your fears and be bolder in your choices. It will not do you good to be so safe or scared all the time. Life is simply not meant to be lived that way! This stone will also help you control your anger, impatience, annoyance, and frustration. This powerful healing stone will help you avoid disagreements and fights, especially those which are of a petty nature. It will encourage an open and honest communication, and it will remind you to put yourself in the other person’s shoes for a better perspective. If you and your significant other are going through a rough patch, Coral will keep the bond strong. It will remove your tendencies to assign blame or become resentful. Instead, it will encourage you to exert more effort to get to the root cause of the problem. It will sweeten relationships that have become dull, passionless, and loveless. This stone will also help you in forgiving the sins of the past so that you can truly move forward and make a new beginning. Coral will encourage you to work on your marriage compatibility and discover new things that you and your partner are compatible with. It will strengthen the love that you share and help you work on the aspects of your relationship that are weak or struggling. This stone will restore the harmony in your heart. It will quiet your emotions and remove the fear and tension that you’re feeling. It will also clear your judgment, resentment, and frustrations at being told what to do. When used as a charm, Coral will help with women who are struggling with fertility. Wearing a piece of Coral is also said to protect women from widowhood. When worn on the body or placed inside the home, it can help in warding off bad spirits and negative energies. The energies of Coral are also perfectly suited to the land. Place it on any piece of land that has become stagnant or lagging and you will soon experience a richness in this space. Coral should not be worn with perfume because harsh chemicals can have an effect on the appearance of your Coral jewelry. Make sure that you also shield it from strong, bright lights and hard blows. Coral is a very effective stone in getting rid of compulsiveness and quitting bad addictions. It will be very potent when combined with Labradorite, Herkimer Diamond, Dumortierite, Botswana Agate, Citrine, Rose Quartz, Obsidian, or Nebula Stone. It can also be a good stone in relieving allergies, especially when you pair it with Carnelian, Moldovite, Garnet, Brecciated Jasper, Aventurine, and Apatite. It can also have healing effects on the bladder when you combine it with Orange Moss Agate, Amber, Orange Kyanite, Bloodstone, Morrisonite Jasper, Green Calcite, or Hessonite. Coral’s energies will also improve the functions of the circulatory system and strengthen the blood and the blood vessels. You can wear it with Fire Agate, Garnet, Malachite, Red Jasper, Tiger Iron, Hematite, or Copper. If you wish to boost your intellect, you can also wear Coral with Celestite, Rose Quartz, Emerald, Ametrine, Chalcedony, Pyrite, or Spinel. If you wish to attract love or strengthen the love that you have, Coral will be very effective when paired with Selenite, Amber, Ruby, Emerald, Rhodochrosite, Kunzite, Rose Quartz, Jade, Pink Tourmaline, Lapis Lazuli, Pink Calcite, or Moonstone. Coral will evoke romance, passion, and strength in your life and in your relationships. It’s a stone that symbolizes joy, abundance, protection, and prosperity. It will help you understand your own purpose in this world and the reason behind everything that happens in your life. This stone will focus your energies on the pursuit of your goals. It will protect you from despondency and depression, and it will get rid of your frustrations and resentments. The energies of this stone will encourage creativity, visualization, and balance. It’s a stone of optimism, and Coral will encourage you to see the bright side of life! Passion, vitality, strength, survival, fertility, courage, sexual potency, mercy, action, danger, war, fire element, conflict, sports, independence, assertiveness, competition.